Just beat the first boss! It was just my third try - I didn't realize how much I'd picked up from watching my partner play. Well, he was also watching and calling when to dodge and when to jump. Definitely didn't expect to get sucked into this game but I'm enjoying it. I've gotten to the biome with the lights/killer fog a couple of times but I haven't gotten through it yet. This is where I keep getting stopped. That section is rough. How did the final boss battle go? I haven't gotten anywhere near it. I've gotten to the biome with the lights/killer fog a couple of times but I haven't gotten through it yet. Maybe you know this, but you don't have to go that way. The other exit in the preceding area takes you to a more manageable biome. I've only played five times on this version. The other exit isn't reachable for me yet. Congratulations! I beat them on my third try too, great feeling isn't it? Are you talking about a second exit out of the village biome that comes after the Consienrge? I've picked up that there are usually two exits in each biome but you need a specific rune to reach the 'second' exit. My most recent new rune is the one that destroys certain floors. I'm guessing I need to find a new rune to find the second exit in the village? I'm currently exploring the ancient sewer so maybe I'm close? Don't worry about killing everything, or at least draw things to the permanent lights. Otherwise, the timing will kill you. From the Village, the only item you need is the one to grow the vines, which you already have if you're in the sewers :P, so you have access to both exits (see my answer below). Keep going in the sewers though, you can unlock something else in that spoke. You can always get from Stilt Village to Clock Tower, it doesn't require any items. However, there is only one key and you spend it either on unlocking Forgotten Sepulcher or the Clock Tower (the door to which is a bit farther ahead). I was using the keys on the first two doors I found so I was naturally ending up going through the exit that requires a rune. I'll try taking the other route the next time I'm in that biome. That's quite the difficulty spike isn't it?? I feel like I need to completely rethink how I approach this game. Two things that helped me beat him were focusing on one primary stat, I always put upgrade the same stat when I get a scroll that lets me (otherwise I just go for the one with most HP), and using items that give you a damage (taken) reduction, when you stack it up it makes a huge difference. This game is still pretty great in short bursts. It could be maturation effect from the time I spent in beta but I took the game’s advice and started a brand new save. The drops feel more plentiful and the damage less harsh than before. I’m having a very solid run so far and it’s not like I’ve been playing this a tonne. Is this what Dark Souls feels like? No, Dark Souls final bosses tend to be pretty fair and comparable with the rest of the game in terms of difficulty. I think I'm dropping the game for now. It isn't grabbing me like I hoped, and if I'm gonna beat my head against something extremely hard I think I'd rather go back and try to finish Wizard of Legend. The difficulty in Dark Souls is misconstrued. You must learn how to play the game and fight. New enemies present a challenge. Also if you rush it will destroy you unless you're a speed runner. Seriously give it a shot. It is one of a few games that gives me pure joy when I overcome a difficult boss. Yeah the Souls series teaches you to play better the whole time. There's a great feeling of accomplishment when mastering those games. No, I'd say Dark Souls is great at making you feel like something is insurmountable, when in fact it's not. I've beaten the final boss in Dead Cells a few times now and I don't think it's a good fight. It doesn't give you the time to learn the fight, which is criminal considering it comes at the end of a 30-60 minute run (Dark Souls is quite different in that you almost always have a lot of time to observe enemies). That being said, I don't think the final boss being bad is a huge issue because beating him is kinda anti-climactic anyway. The first time you do it, you do get something, but on subsequent play throughs on the same difficulty, the game just kinda ends afterwards. Not even a chance to spend cells, and he doesn't even drop any. The enjoyment of the game comes simply from the moment to moment combat. The roguelike / rougelite elements of the game are by far the weakest part of the design in my opinion. Thanks for all the responses about Dark Souls, you've really sold it to me. I think I will pick it up when it comes to Switch, and as it happens the new release date was just announced; 19th October. That being said, I don't think the final boss being bad is a huge issue because beating him is kinda anti-climactic anyway. This does make me feel better about it! I think I'll take a break from playing for a bit and then start dipping in and out of the game when I feel like it. Made it to The Concierge tonight for the second time. Figured out a pattern and whittled it down to a couple hits left before it finally got in the game and stomped me again. Also made it to The Ossuary for the first time, which lasted a good 40 seconds before I was pummeled by some kind of lightning-orb statues with overlapping damage fields. Definitely a GOTY contender, currently tied with Witcher 3, but I see it passing that soon. Also made it to The Ossuary for the first time, which lasted a good 40 seconds before I was pummeled by some kind of lightning-orb statues with overlapping damage fields. I'm currently trying to get the rune that's in the Ossuary but for the life of me I can't remember how I won the fight against that giant elite sword guy on the PC. I'm certainly failing at it roundly on the Switch. I've managed to hit him probably 10 times with fairly stacked builds and I don't think I've managed getting him below maybe a quarter health. For bosses, one of the key things is utilizing ranged and damage-over-time skills and/or grenades. That way the majority of your time is focused (or frantically) dodging and rolling away from attacks. Ranged attacks are then used as potshots. Personally, I really like having the slicer and double turret. Focus on tactics and take the skill cooldown mutation. Two of the three bosses I've faced have been very easy since I don't even have to attack them myself. With three swigs of my health flask, I know I can take a lot of damage and be far more reckless. Yeah ranged items work really well. Just throw them down and dodge/shield the enemy attacks. Last weekend I had a dream run, where I got the rune from the sewers, and defeated two bosses, the first of which (Concierge) I had never defeated in Early Access on the PC. My tactics build was the sole reason for my victory. That run has almost turned me off of the game, as I don't know if I will ever be as lucky again. However, I have done a run this week that netted me the Ossuary rune, and I'm interested in seeing what that unlocks. What like best about the game is the flow. You feel like you are always moving forward. Even when you die (and lose cells, which is frustrating), you immediately pick up new weapons and start again. I enjoyed Rogue Legacy for a while, but after each run you stop to make decisions about what to buy. Eventually I ran out of steam. Here, the beginning is so smooth because the purchasing decisions are made later. It's easy to keep going. It takes a really special Roguelike to keep me playing, and I've enjoyed the game so far. Will I ever finish it? Not sure. Finally got the Spider Rune! Didn't realize I had to take an alternate path, kept thinking it was farther in the game. And entire new boss that I didn't even know about. That was cool. once and got it down to 3/4 health. This game is so good at helping me learn from my mistakes and encouraging me to try different tactics. While my main strategy his high Tactics with deployable turrets, I reached what I think is the end boss with ice and cluster grenades, Hayabusa Boots, and extremely high damage lightning strikes. Ultimately I’d prefer a quick weapon, bow, and turrets but the most success I’ve had is not with that build. Those level 1 boots are pretty amazing. Kicking enemies into walls and off ledges really can carry you far. I had a great run with those last night, through 2nd boss maybe to the last stage. I think I'm abandoning the switch version until they update it with some performance fixes. The framerate going down the toilet in all the later stages when they get busy is just too much for me. It requires adjustment on the part of the player and I just can't get used to it. Last run I got the by far highest damage weapon I've ever gotten, and I was even a bit unlucky with my attributes. 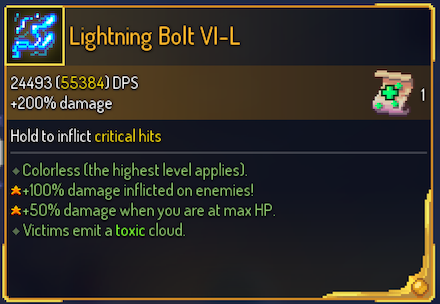 I could easily have had 50% more damage! I restarted on the 1.0 version and made it to the Clocktower level on that first run... having to re-learn how to play since I'm back down to little potions, and I've never used mutations before. Good times? Dead Cells and I are still 'on a break', but I'm starting to get the itch to dive back in. Keeping a close eye on this thread doesn't help!